Wait…What? Close Rates Can Be Too High? Whenever we conduct a live webinar, there are usually a few questions that come in long after the session is over. Of course, we answer these post-session questions via email. And in a way, it’s somewhat unfortunate…because everyone else misses out on hearing some really interesting stuff! The answer is absolutely and emphatically, yes! It’s certainly possible for close rates to be too high and it’s definitely “a thing”. In the webinar session, we talked about how really low close rates can be signals or symptoms of other things. We discussed how low close rates might be indicative of inaccurate prospect targeting, weak or undifferentiated sales messaging, poor sales skills development, uncompetitive offerings and pricing levels, etc. Well, on the other end of the spectrum, close rates that are really high can also be signals or symptoms of other things. But obviously, super high close rates will be indicative of very different things than really low close rates. Your pricing is too low and you’re leaving money on the table. You might be able to raise your prices without a commensurate impact to volumes and see a massive increase in profitability. You’re not investing enough in marketing and lead generation. You could likely tolerate a bit more “waste” in your efforts to reach a bigger portion of your addressable market. Your qualification criteria are too tight or too time-bound. Similar to the point above, you could likely sacrifice a little sales efficiency in the interest of effectively cultivating more prospects who aren’t quite ready. Of course, these things could also be mutually reinforcing or contributing to each other. In other words, your pricing could be so low that the sales you win can’t generate enough profit to be able to market more broadly, or invest more in sales resources for longer-term prospect cultivation. In this case, you’ll need to approach it in a step-wise fashion—i.e. increase pricing to generate more profit before investing more in marketing and sales. Now, I do have to point out that while it is definitely possible to have close rates that are too high, it’s a somewhat rare phenomenon. So it’s possible, but it’s not all that probable. Still, it’s important to recognize that “low” isn’t the only signal you’ll want to pay attention to or be on the lookout for. Very often, a “high” signal can be just as telling. Trial and error with something as important as your close rates is risky. How do you know which strategies and tactics you should use to improve? In this on-demand training webinar, learn effective strategies and tactics for improving your sales team's ability to win---at scale and with less risk. Finding ways to improve lead quality and quantity can be a target that's constantly moving. This recorded training session exposes our latest research, highlights common lead generation challenges and what some B2B companies are doing to overcome them. What if there was a way to analyze all of your customers at once, identify the whitespace opportunities, and serve them up to the sales team on a platter? Learn the seven step process for doing just that. As sales ops practitioners, we need to recognize that not everyone in management understands what we do. 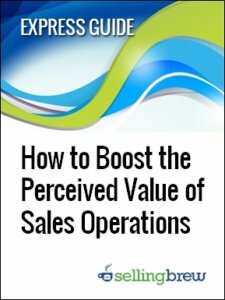 In this Express Guide, learn nine strategies and tactics for proactively enhancing the internal perceptions and profile of your sales ops function.